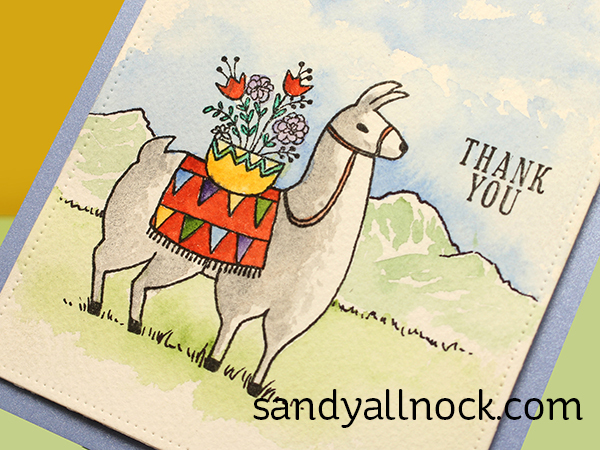 This sweet llama from Flora and Fauna just cried out for a scene – some sky, some mountains, and a little grass. Just enough to make it interesting! 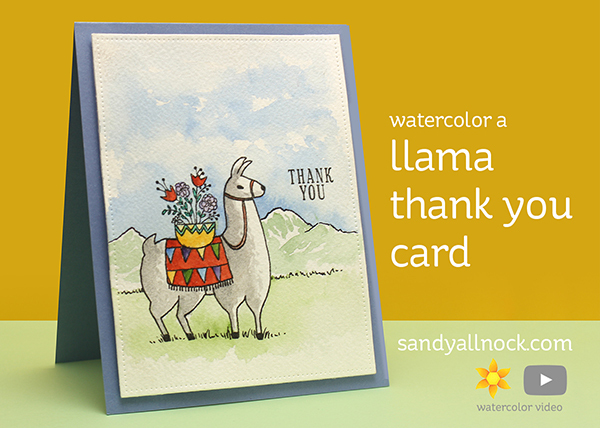 Check out the video to see how I watercolored this one! Watch the video below or click HERE to see it in HD on YouTube. Sweet card. I love the soft backgrounds you create. I always learn something new after I watch your videos. I love your color choices, your theme, just everything. Thanks for the tip on using a “silver brush”. I followed your suggestion and bought a #8 a little while ago and I absolutely love it…TFS your God given talent with the paper crafting world. It’s like magic watching your paintings come together! AWESOME painting, thanks for the video! WOW, always learning something as I watch you. Another great tutorial. One things you are teaching me is to loosen up and try some new things. And I really need to break that perfection thing. It makes me hold back and it’s time to let it go. Love your video. Just starting in making cards. Love your ideas. I do have a question. You mentioned using post it notes and mystic?? when using your stamps. Do you have a video on that?? Help! !